OSHA statistics tell us that Americans suffer 85 deaths, 35,000 serious injuries, and another 62,000 non-serious injuries every year related to forklifts. Of those, 46% involve people being crushed between trucks, run over by a forklift, or crushed between a forklift and a surface. The thing about these grim numbers is that they are largely avoidable. Comprehensive plans require forethought, buy-in and analysis. They cannot be forced from above, and must involve more than just the EHS team if they are to succeed. To start your process, you must factor in all stakeholders and their needs. This team should include safety personnel, plant operations, and people who work in the plant. There isn’t any set number of members, but the team should be comprehensive and empowered by senior management. Forklift safety can become contentious when it’s forced by the safety team, as operations managers and workers are focused on—and graded by—productivity. Including all the relevant personnel reduces conflict and helps you get a better solution. If you are dealing with multiple facilities, you should have a team from each site, using the same processes. You will get a better, more broad-based solution set that way. What controls or processes exist today that segregate vehicles from pedestrians? What are the current visual and audible control systems? What on-board controls are installed on your forklifts? What are the current behaviors (for drivers and pedestrians)? Assessments may differ from company to company (and even site-to-site) but should be somewhat universal in nature. Elimination: In this scenario, an area is set up for foot traffic only. Forklifts are not allowed at all. These areas should be delineated with guardrails or other physical barriers. You can also employ painted or taped crosswalks or other visual methods to mark these zones when necessary. 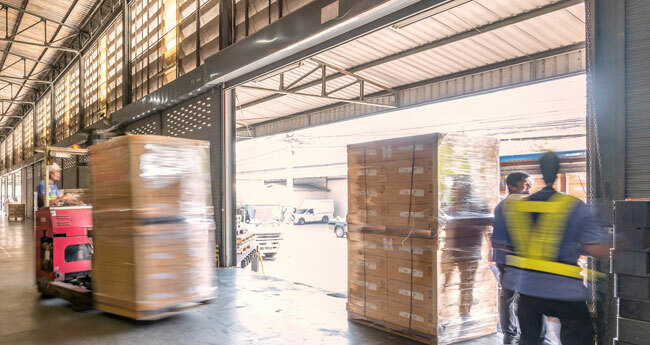 Alternative pallet handling methods: Identify areas where foot traffic is constant, forklift traffic is not desirable, but pallet movement is necessary. You might handle pallets with stackers, pallet jacks, conveyors, pallet dollies or other means rather than forklift. Barriers & physical controls: Are physical controls such as guard rails, bollards, curbs, gate systems or other solid separation means present? Can they be installed to improve the situation? Warning systems: Protective systems like sensors, mirrors, signs, warning lights, or proximity detection technologies. Score your facility on the presence or absence of these warning systems. Training & processes: What has the plant put into place in terms of training, rules, and processes that impact forklift safety? (Example: require dedicated crossing points, or exclusion zones). Are workers allowed to use smart phones in the facility? Are they paying attention to the pathways? How are egress points into the facility handled? How are guests and visitors protected? It’s critical to understand where your pedestrians and forklifts interact. When you create a safety plan, you will segregate people from forklifts as much as possible, and then focus on interaction zones where separation it isn’t possible. To do this, print a drawing of your facility and map these mingle points. 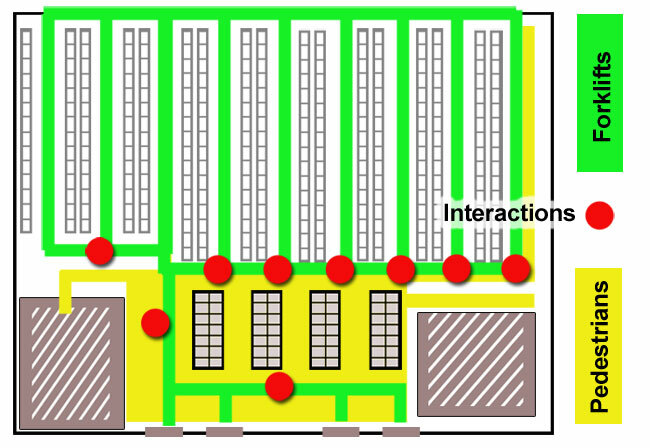 Create a color-coded visual representation of pedestrian traffic aisles and then use a different color to represent forklift areas (in the example above, pedestrian areas are yellow, forklift lanes are green, and interaction zones are red dots). The points where pedestrians and forklifts intersect are your interaction zones. Mark and number these interaction zones. 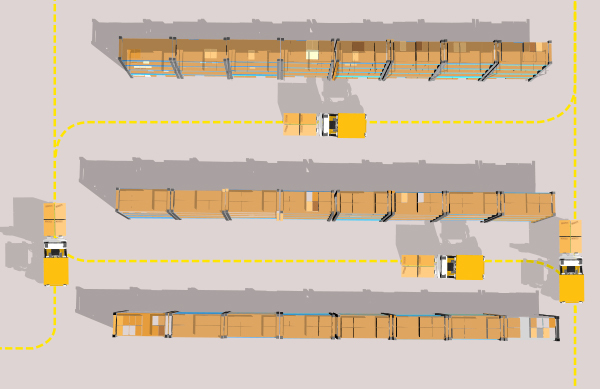 Accident probability: How close will forklifts and pedestrians get to each other? How tight is the area? What speed are the forklifts traveling? Is visibility adequate for safe operations? Are pedestrians paying attention to their surroundings? Are drivers honking horns and actively looking for pedestrians? Traffic levels at the interaction point: How often do people pass through or work in the area? How frequently do forklifts run through? Is it infrequent, constant, or somewhere in between? Frequency of pedestrian/forklift conflict: Count the number of times per day that forklifts and pedestrians intersect, or are both present in an area that lacks guardrails or other physical barriers. This does not have to be direct contact. It can be the simple presence of both types of traffic in an area where an accident is possible. Once you have profiled each mingle point, it’s time to address that particular point, with a plan and priority. At this point, you have a team, a baseline assessment, a list of areas where people and lifts interact, and a risk score for each of those areas. It’s time to build a solution. These solutions can vary from zone to zone, based on the factors in your assessment. Whenever possible, create exclusion zones where people and forklifts aren’t allowed to mingle. Decide whether or not the zone can be changed into an exclusion zone, where there is no interaction between people and forklifts. You will want to create as many exclusion zones as possible, since they are the safest alternative. For instance, many companies build pallet rack systems with carton picking on the floor level (or with integrated carton flow) and bulk pallet storage in higher bays. This is an efficient way to use space, but it does create a full aisle where people and lift trucks frequently share space. This may change plant layout and routes a bit, but the safety gains are always worth it. Implement hard barrier controls, such as guardrails, bollards or gates. These should be used to create areas where people are physically separated from lift truck traffic. Use visual controls, such as floor striping, signage, forklift warning lights, mirrors or paint lines. These are relatively passive methods, but they are necessary to help reinforce expected behavior and make people aware of the potential dangers. At this point, you have made changes in the way people and forklifts interact. Over time, you’ll need to re-asses the situation, using the same criteria you used above. If certain zones are still problematic, further changes must be made. Forklift safety is a process, and as such it can always be measured and improved. Companies that invest in it may avoid crippling–or even fatal–accidents. These are mostly avoidable accidents with the right processes, training and safety systems. Your team, scoring system and risk assessments should be specific to your company, your plant situations and other factors you decide on as you move forward, but making pedestrians safe around forklifts should be your true north as you make decisions.